Having a motorcycle lift stand will not only save you time and space, it makes working on your old scoot more enjoyable. By raising the height of your motorcycle, it's much easier to work on, not to mention easier on your back. There are so many (actually too many) styles and brands of motorcycle lift stands to choose from. The one good thing about that is competition between brands has brought down the prices, making them more affordable than ever. Designed specifically to service motorcycles, motorcycle lift stands can be divided into several categories: scissor lift, pneumatic (compressed air), pneumatic/hydraulic, and electric/hydraulic. Remember that they all get the job done, the higher-end ones just work quicker and quieter, and may offer a little more stability. When shopping for a lift stand; to properly lift your bike, the weight capacity should be at least 50% greater than the weight of the motorcycle. For example, if your bike weighs 750 pounds, look for a lift table that has a capacity of 1,500 pounds. Consider where you will store it - they take up quite a bit of floor space. Many riders park their motorcycle on the lift when it's down. Using price, availability, and features as perimeters, I have selected four of what I consider to be the best overall choices in each category. Pneumatic tables are most common. They are generally rated to 1,000 lbs and operate by compressed air. This means you must have a decent size air compressor in your garage. Titan Ramps 1,000 lb capacity motorcycle lift table is 81-1/4" with a width of 21-3/4". 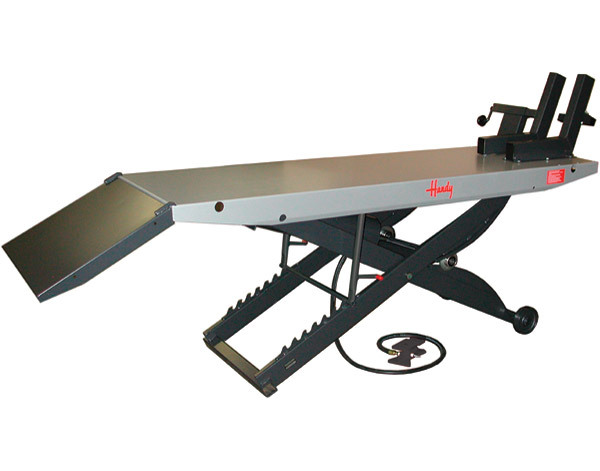 A front wheel vise chock, stop plate, and tie-down straps are included. For additional safety, the work surface is diamond-plated to reduce the risk of slipping. This hydraulic lift table is operated with a two-foot pedal. You raise the table by pumping one pedal, and lower the table by pressing the other pedal. Air over hydraulics, also called pneumatic/hydraulic, is a simple and cost effective way of producing a "soft" acting hydraulic system. They are usually rated for 1,500 lbs or more, and tend to use a lot of air. If you already have a large air compressor in your garage, the APlusLift MT1500 is a good choice. It has a 1,500 pound capacity, and includes a small service jack and a rear drop-out panel for easy access to rear wheel removal. Air requirements are 90 PSI. 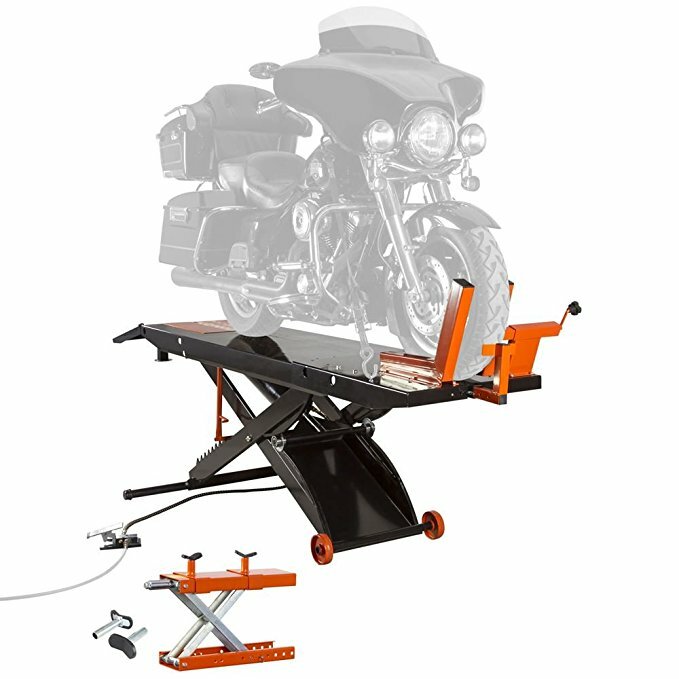 Measuring 86-5/8" L x 26-3/4" W, the Black Widow BW-PROLIFT-HD is a heavy-duty motorcycle lift table with a 1,500 lb capacity. Features include a 20" loading ramp, diamond plate surface and a rear drop-out panel for easy access to rear wheel removal. 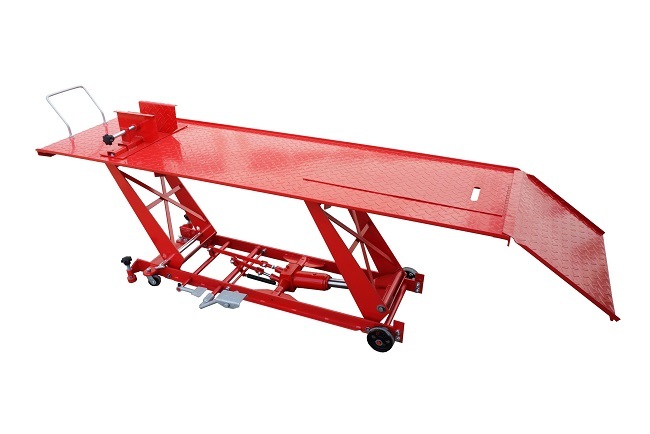 TIP: If you need your lift stand to be mobile, look for one that has wheels included. The BW-PROLIFT-HD has a height range of 9-1/2" to 31" lifting range. There is also an optional conversion kit to turn the ProLift into a wider work bench to fully support ATV's, lawn mowers or snowmobiles with this extension kit. This is an air operated unit that requires 90-110 PSI minimum. 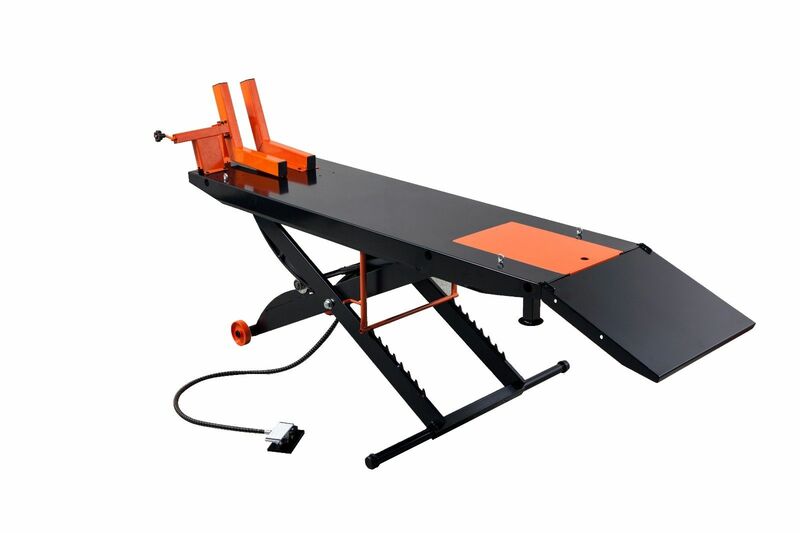 Electric over hydraulic tables are the most expensive, but are the smoothest and quietest motorcycle work stands available. They are built for commercial use, run on electricity, and require no compressor. 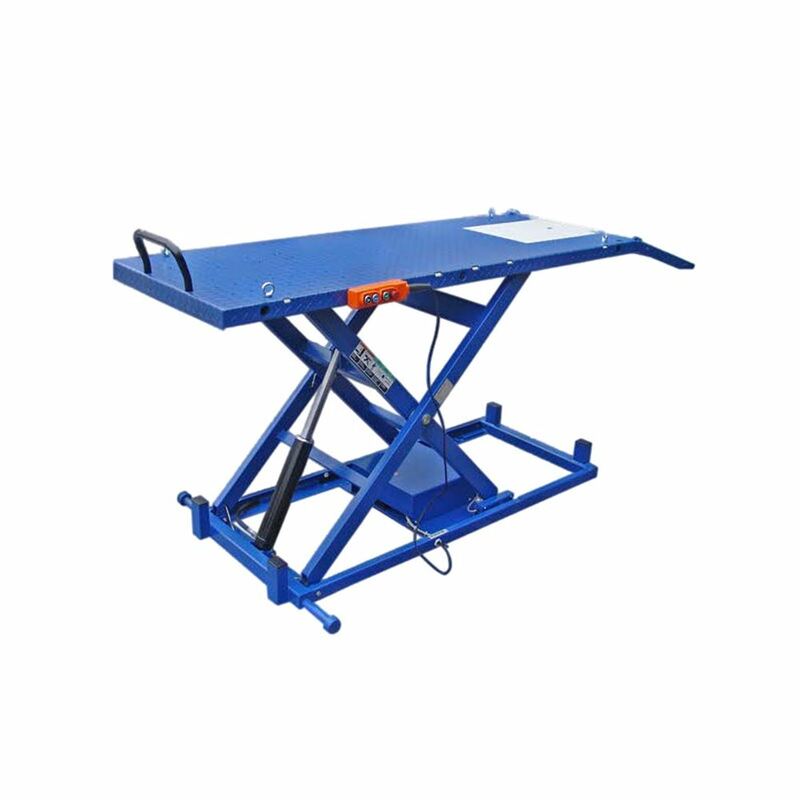 With a huge 2,200 pound capacity, the Tuxedo Hydraulic Motorcycle Lift Table is designed for professional shops and serious DIYers. Platform measurements are 88.6" width and 31.5" length. Boasting an industry-leading platform size and weight capacity, the Tuxedo hydraulic lift table also offers the smooth and quiet operation. It features a 110V integrated hydraulic power unit operated by a hand-held remote control pendant. This question gets answered with, "How much do you want to spend?" While some have more options than the others, they all do the same thing, so the best motorcycle lift stand will be the one that fits your budget. Although all motorcycle lifts do the same thing, some may better suited for your needs. Some have optional extensions, making them longer to fit custom choppers. Others have a rear wheel drop-out, which allows the back of the stand to be removed. This gives easier access when replacing rear tires. Lift stands are made of steel and can weigh anywhere from 250 to 550 pounds. When you buy a lift and have it shipped to a residential location, you may need the assistance of a lift-gate truck. There may be extra charges for these services. Some companies offer free shipping within the U.S. Remember that before you buy a lift stand, know what your bike weighs and select a lift that is rated for the load. 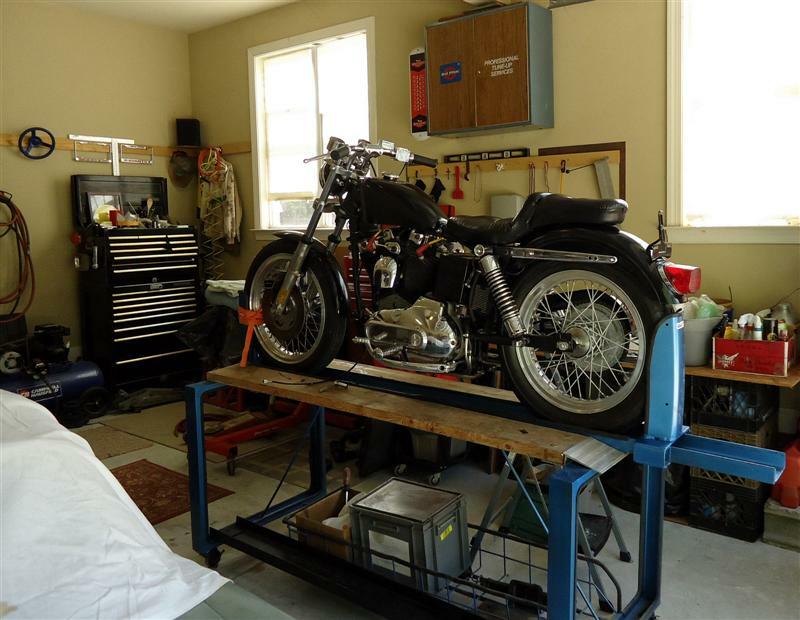 Whether it's regular maintenance like changing the oil, cleaning and detailing, or doing a custom bike build, once you use motorcycle lift stand, you'll wonder how you ever got by without one. If buying a lift stand is not in the budget, consider making a motorcycle work table. I've seen all kinds of home-built types, some as simple as a wooden platform with a ramp, tie-down hooks and a wheel chock. The work stand in my garage was built by a friend of mine. This site participates in several affiliate programs. For more info, visit our disclaimer page.